"Riveting…a worthy investment…this book has real wisdom." "A book with so much painful truth packed into its pages that every person who’s ever married or plans to marry should really give it a read." 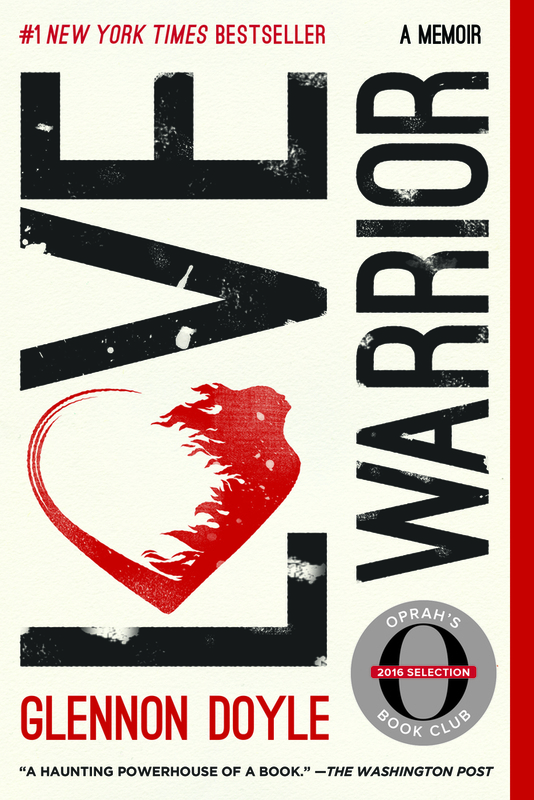 A memoir of betrayal and self-discovery by bestselling author Glennon Doyle, Love Warrior is a gorgeous and inspiring account of how we are all born to be warriors: strong, powerful, and brave; able to confront the pain and claim the love that exists for us all. This chronicle of a beautiful, brutal journey speaks to anyone who yearns for deeper, truer relationships and a more abundant, authentic life. "A testament to the power of vulnerability. Glennon shows us the clearest meaning of 'To thine ownself be true.' It's as if she reached into her heart, captured the raw emotions there, and translated them into words that anyone who's ever known pain or shame — in other words, every human on the planet — can relate to. She's bravely put everything on the table for the whole world to see." "Glennon is not merely relaying a narrative; she is offering her story with the hope and purpose of connection. Love Warrior... draws you in close, as if the author is talking to you, and only to you. Listening to such a warm and emotionally intelligent author is a worthy investment in a course on difficult conversations. But I suspect that... what will win you over is all the 'terrible magic' that happens when things fall apart." "An incredible, dark, poignant, vulnerable personal account about surviving rock bottom and finding a better life. You will be inspired by [Glennon's] resilience, strength, and womanhood." "This memoir isn’t really about Glennon rebuilding her relationship with her husband; it's about Glennon rebuilding her relationship with herself. It’s about one woman letting go of the gendered messages she’s been surrounded by her entire life, and communing with her fullest, most authentic self. Utterly refreshing and... just totally badass." "Love Warrior reaches a depth of truth and power and emotional gravity that is rarely seen in the world, and even more rarely spoken aloud. Glennon's story about the resurrection of her marriage (a tale of a woman daring to come into her body, and a man daring to come into his mind, and the two of them daring — with outrageous courage — to trust each other) is something beyond merely inspirational; it is epic. I think of this book as the vital, long-overdue, much-needed sister memoir to Eat Pray Love. Glennon lifts the roof off her whole house — her whole life — and examines everything, right out in the open. She has, indeed, become a Love Warrior. This book is an act of love and truth and generosity; it will change lives." "This is a book about what it means to be human — to wrestle with love, hurt, addiction, vulnerability, intimacy, and grace. Love Warrior blew me away. We can all find pieces of our own stories reflected in Glennon's powerful words. We are so lucky to have her courage and wisdom in the world. We need this kind of truth telling if we are ever going to find our way back to each other." "How can I do justice to this book? Moving and brilliant and funny and shocking and heartbreaking and inspiring, Love Warrior raises provocative questions about just what is possible for a person, a marriage, a family, a life. At the heart of this story is the insistence that we don't have to settle — we can explore our shadows, and we're not just going to survive it, but we're going to come out the other side a whole new person with new love, new hope, new strength, and maybe even a new marriage. This is a big, stunning, buoyant, honest, raw glimpse into the life of an astonishing woman, but it is also a punch in the face to anyone anywhere who believes that this is just how it is and it's not going to get any better." "This elegant, moving memoir is about one woman's marriage but also much more than that. Glennon writes about a hunger for love that all of us feel and the only food that ultimately feeds us. She understands the unique relationship between spiritual and romantic love, and in finding one, she masters the other. Truly a wonderful book." "When I finished the last page of Love Warrior, I sobbed. I sobbed because I was in awe. Because I didn't want it to end. Because it made me believe more deeply in love, in humanity, in forgiveness, in God, in marriage. Glennon and Craig have invited us so far into the messy, beautiful, difficult insides of their hearts and lives, and what we find there is profoundly inspiring. This is a book that will change lives, change marriages, change the way we think and talk about what love really is." "Glennon Doyle has mastered sharing her emotional life with the world, which she does nearly daily on momastery.com. Now she lays herself bare once again in Love Warrior, chronicling her struggles and the depths of her resilience in the darkest of times. A heroic achievement." "A compelling story about self-discovery. Candid, brave, and generous." "A breathless story, beautifully told. Love Warrior presents an intense and absorbing narrative while reaching for something bigger and more quixotic, the mystery of intimacy itself." Glennon Doyle Melton is the author of the #1 New York Times bestseller Love Warrior and the New York Times bestseller Carry On, Warrior. She is the founder of the online community Momastery, and the creator and president of Together Rising, a nonprofit organization that has raised more than seven million dollars for families in crisis. Glennon is an activist, a sought-after public speaker, and a columnist for O, The Oprah Magazine. Her work has been featured on The TODAY Show, The Talk, OWN, Chelsea, Dr. Oz and NPR; in The New York Times, The Washington Post, The Atlantic, Forbes, ELLE, Glamour, Family Circle, and Newsweek,among other television and print outlets. Glennon lives in Florida with her family.